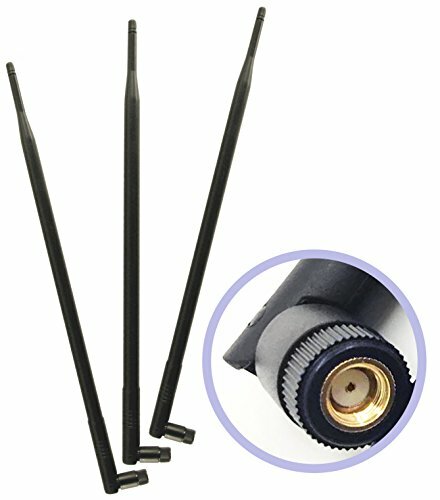 This Wi-Fi Antennas will significantly increase the range and strength of your Wi-Fi signal..
Our Omni-directional antennas are a direct replacement for the antennas that comes standard with your router, access point, VOIP device, or PCI card. Each Antenna is Omni-directional, no aiming is equired - it can send and receive Wi-Fi in all directions. This Antennas is stronger then the less powerful booster antennas offered by major manufacturers. PACKAGE INCLUDES: 3pcs of 9dBi 2.4Ghz/5Ghz Dual Band Omni Directional Antenna with RP-SMA Male Connector For Router and other Wireless Network Devices. NOTE: Change ALL the antennas into our 9dBi Antennas, if your old device has more than one antenna. If you have any questions about this product by GP Electric, contact us by completing and submitting the form below. If you are looking for a specif part number, please include it with your message.